The most common thing we hear from our customers is that they want a home that is open, where people can be “together” even if they are in another room. This has moved the building/design industry into an era of less walls, entry ways opening up into living rooms, that are connected to an open kitchen and dining room, etc. • Change of floor surface. Carpet in the living room, tile in the entry and kitchen, and hardwood in the dining room. This gives the feeling that there are different spaces, without having a physical barrier making that distinction. • Different heights or patterns on the ceilings. Bumping up the ceiling in the dining by 3-6 inches, creates a defined space, and makes the room feel larger. Adding contrasting lighting from the kitchen, will enhance this definition. 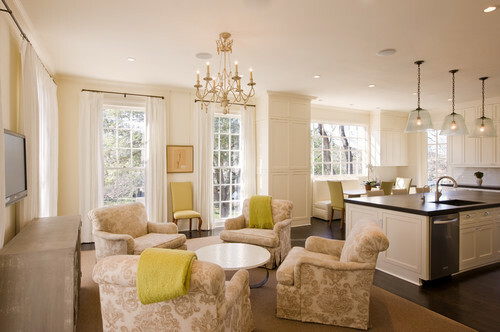 • Painting rooms different shades or adding accent walls. To keep the cohesiveness of the open concept, paint colors should be similar. Having bright, contrasting walls can actually make your space seem smaller. • Placement of windows in each room. These rooms were also defined by the placement of a casual eating area, giving people a place to sit, socialize, and still be a part of the action in the kitchen. How have you defined the different spaces in your Open Concept Home? We would love to hear your ideas, leave them in the comments section.